Rinse the quinoa in cold water. In a saucepan, bring 1 1/2 cups water to boil. Add the quinoa. Return to boil; then simmer until the water is absorbed, 10 to 15 minutes. Cool for 15 minutes. While quinoa is cooking, mix olive oil, lime juice, cumin, coriander, cilantro and scallions in a small bowl. Set aside. In a large bowl, combine black beans and chopped vegetables. Set aside. 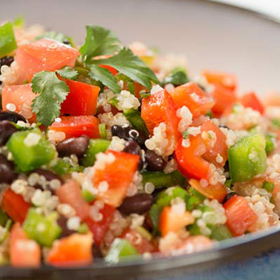 Once quinoa has cooled, combine all ingredients, including black pepper (if using), and mix well. Cover and refrigerate until ready to serve. Serving size: 1 cup. Amount per serving: 208 calories, 5g total fat (1g saturated fat), 0mg cholesterol, 34g carbohydrates, 9g protein, 7g dietary fiber, 284mg sodium.